I was recently asked to paint some basic baseball banners for our Senior Pastor and Youth Pastor at church. Our Senior Pastor, Nick, is a Yankees fan (ew, gross! 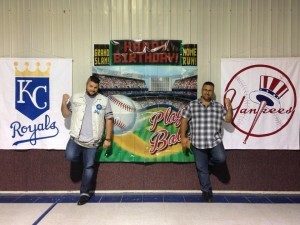 ), and our Youth Pastor, Ryan, is a Royals fan (awesome sauce!). Since I don’t like doing anything basic (read: glutton for self-inflicted punishment), I set out to make something for these 2 life-influential guys that they would really enjoy. I hope they do! These are free-hand sketched, then hand-painted with acrylics on duck cloth canvas. Happy birthday Nick and Ryan! I am a Christian man with a beautiful wife and 4 awesome kids. I have been a mechanic (almost 14 years), a software developer since 2008, a visual artist (most of my life), and am constantly keeping myself busy doing something. Sean Netherton on Finally finished Freedom!